We have a bittersweet announcement to share. After 20 years serving as Zoo Boise Director and Executive Director of the Friends of Zoo Boise, Steve Burns has accepted a position to lead the Hogle Zoo in Salt Lake City, Utah. 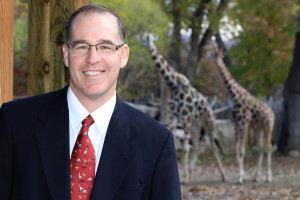 During his tenure, Burns has helped to transform Zoo Boise and turn the act of visiting the zoo into a conservation action with positive impacts across the globe. His most recent accomplishments include spearheading the successful Zoo with a New View Capital Campaign, which raised $8.9 million to build a new 2.5 acre Gorongosa National Park Exhibit at Zoo Boise. The City of Boise is launching a nationwide search for a new Zoo Boise director.